Arthur Streeton was born at Mt Duneed, Victoria, and is best known as one of the key members of the so-named Heidelberg School. He left Australia in 1898 to further his career in England, returning for a visit in 1906. In 1908, the year he married in London, Streeton made two painting trips to Venice. Some of the paintings he made there were exhibited in London, but a large number were shown in Melbourne at a successful exhibition 'Arthur Streeton's Venice' in 1909, and others the following year. 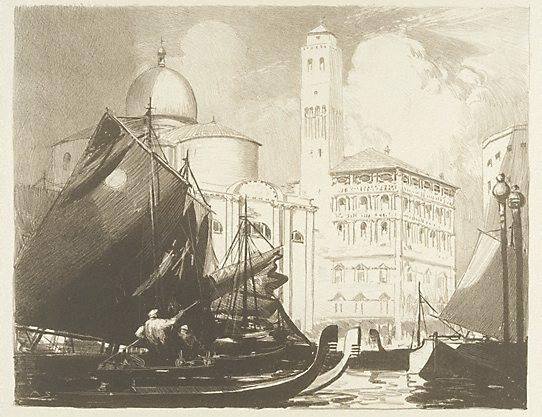 It is likely that this lithograph is after a painting Streeton made in Venice in 1908, Palazzo Labia, exhibited in Melbourne in 1914 and listed as from the collection of Dr Peter Reid in the 1935 Arthur Streeton catalogue (number 357). It also shares many features with another painting, in the National Gallery of Victoria, 'San Geremia and Palazzo Labia, Venice' 1908. Streeton was first introduced to etching by Livingston Hopkins; he also made some etchings in London. In a letter to Baldwin Spencer dated 8 January 1913, he enthused about Rembrandt's etchings in the British Museum, and commented on the profitable market for contemporary prints in London (A Galbally and A Gray, 'Letters from Smike' p.124). However, only six lithographs by Streeton are known. 'Palazzo Labia' was exhibited in London at the Baillie Gallery in 1913 with five others. Four of these were included in a 1925 exhibition of his work in Melbourne ('The Rialto', 'Corfe Castle', 'The ballroom', 'Bamborough Castle' and 'The palace'). It was noted in this catalogue that they were printed in an edition of 12 by Thomas Robert Way (1861-1913), Whistler's lithographer; the printer is more likely to have been H P Bray, who worked for Way's firm. Signed on stone to print l.l., "AS". Not dated.